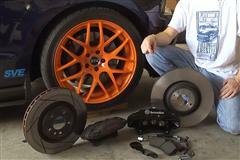 Click here to see all the latest install videos and products to help your S197 Mustang stop faster! To often in our quest for more and more horsepower we over look the brake system. Most of the time we don't even notice our Mustang brake system until it is inadequate to stop all our extra power or is worn to the point that it is calling out for help. Both situations are not safe and can be avoided. That is where the LatemodelRestoration.com 05-09 Mustang Brake Tech section comes to the rescue! 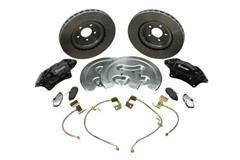 We will provide you with plenty of tech to help you get your Stang's stopping power improved. Whether you are looking to simply replace your worn factory brake components or upgrading to a GT500 brake kit, we have the tech and products you need! !